On September 27, Catalans voted in regional elections to choose their representatives in the parliament of Catalonia. The purpose of these elections was not merely to determine the composition of the legislative body; the elections were also undeniably plebiscitary in nature: The central theme of the entire campaign was to measure the level of popular support in our citizenry for the creation of an independent state for Catalonia. As is well known, our first preference has always been to hold a referendum on this question, but the Spanish government has perpetually denied us this option. The plebiscitary nature of these elections was established by an unprecedented occurrence: The two main Catalan political parties ran together as a joint coalition, which also incorporated pro-independence figures from our civil society. The remaining political parties involved in the elections accepted this framework and the debate on when and how an independent Catalonia could be constructed began. 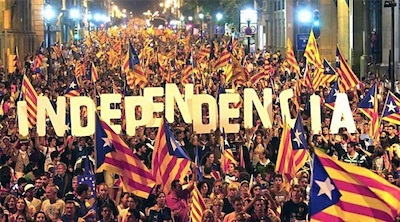 Even the Spanish government, which for weeks had fervently denied that the elections were a plebiscite, ended up accepting it as such, as demonstrated by the fear campaign it vigorously deployed to make all manner of threats as to what would happen should Catalans democratically choose to equip themselves with their own state. The Spanish government in Madrid also set out on a frantic search for international support in defense of the unity of Spain. This resulted in vague public statements by certain government leaders and almost vaudeville responses from others, such as the two different versions of a response from European Commission President Jean-Claude Juncker to a question from a Spanish Partido Popular MEP. The result of the elections confirmed the perception that a majority of Catalans desire for us to begin a democratic, peaceful, civil and negotiated process to achieve an independent state for Catalonia. With record participation of 77 percent, the two expressly pro-independence candidacies won almost 48 percent of the popular vote and 72 out of 135 seats, giving them an absolute majority in the parliament of Catalonia. Parties directly opposed to independence received 39 percent of the vote and 52 seats. The remaining votes, which make up more than 11 percent of all ballots cast, went to two parties that advocate Catalonia’s right to self-determination, but which effectively abstained from weighing in on the question of independence as groups -- so much so, in fact, that members of both parties have asked repeatedly that the votes they received be counted as neither in favor of independence nor against it. I am convinced that Catalans will be able to bring the best of themselves to the challenge of making a better Europe. Given these results, the victory of the pro-independence camp is unmistakable: The people of Catalonia have given a democratic mandate to their political representatives to begin this exciting process. Accordingly, the new Catalan parliament and the new executive government (made up from its members) will soon make a public declaration announcing the beginning of a political process that will culminate in full independence. This declaration will be sent to Spanish, European and other international institutions to make clear to all that the process has begun and to reaffirm our commitment to negotiation and to achieving a gradual and orderly transition that does not adversely affect any of the parties involved. We do not seek to create any abrupt rupture or to break away in the immediate future. To the contrary, we have set a period of approximately 18 months during which we will enact a measured and progressive disconnection. We will not rush, but we cannot wait any longer for the Spanish government to do that which the governments of Canada and the United Kingdom have done with all normalcy: to give a voice -- and a vote -- to the Quebecers and the Scottish, and allow them to freely determine their own futures. The state we envision for Catalonia will be no different from the rest of the European states of our size. In terms of its population, territory, GDP and language, Catalonia has similar proportions to those of many other countries of the European Union. We often mention Austria and Denmark as models and points of reference for an independent Catalonia. We aspire to be a reliable partner, both trustworthy and responsible, and wish to contribute to making a more robust, united, just, competitive and secure Europe. Europeanism has always been an important identifying characteristic of the Catalan national movement: every member of the European Parliament whom Catalans voted into office during the last elections is in favor of a more united Europe with greater solidarity. Catalonia has a long and inclusive democratic tradition, and I am convinced that Catalans will be able to bring the best of themselves to the challenge of making a better Europe. With this in mind, it makes no sense to look at what’s happening in Catalonia as a problem. To the contrary, it should be perceived as an opportunity, and as an example of the strength of democracy in Europe. The best way to move forward in this transitional period is with the utmost transparency and with the knowledge and support of European Union institutions. Continuing on this path without dialogue and negotiation is a scenario that will benefit nobody: neither Catalonia, nor Spain, nor the EU. But a positive, politically negotiated outcome will benefit all parties. Europe has significant experience in resolving similar situations through good politics. Flexibility and the capability to adapt to the reality of a situation is a distinctive trait of the institutions in Brussels, and I am sure that this capacity will be demonstrated once again now.